Infections are serious health risks – and they can happen anywhere. Even in your teeth or gums! A tooth abscess is dangerous for more than just your overall health. When you have one, you’ll likely know it, too! Tooth abscess pain is hard to ignore. If you notice persistent pains in one or more teeth, you may be experiencing a tooth abscess. Learn about the symptoms, causes and treatment options – as well as some ways you can reduce tooth abscess pains at home. When you have tooth pain, it can be hard to identify exactly what is the root cause. Many different sources of pain in your teeth or gums can have nearly identical symptoms! 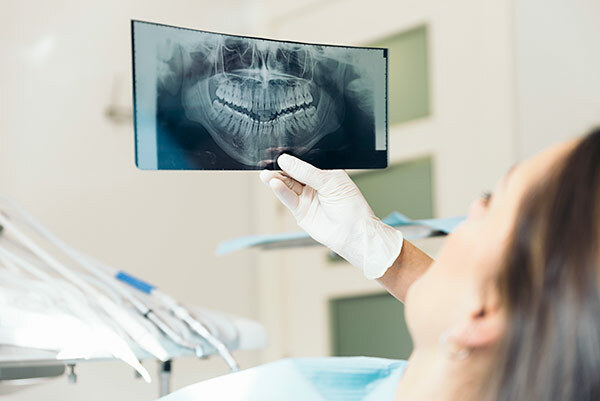 While the best way to figure out any pain is to visit your dentist, you may be able to narrow it down by looking at a collection of symptoms. Left untreated, tooth abscess pain often grows in severity. In short time, it can become crippling! If you have a persistent pain in your mouth or notice any of these symptoms, do yourself a favor and get to your dentist as soon as possible. It’s no secret that you need to take care of your teeth. Without proper brushing and flossing, bacteria will begin to decay the surfaces of your teeth. As this decay deepens, bacteria can reach farther down into the cavities formed. When bacteria reach the dental pulp that contains tissue, nerves and blood vessels, they can infect this area and cause an abscess. Regular dental visits and adequate brushing is typically enough to prevent this from happening. Your dentist will be able to catch decay before it gets deep enough to reach the pulp – assuming you aren’t skipping visits! Similarly, an abscess can form in the gums due to extreme decay. As bacteria continues to weaken your gums, it forms pockets where the gum and tooth should be tightly connected. When bacteria reach these pockets, they can be difficult to clean even if you start brushing and flossing again. As bacteria thrive in these pockets, they will cause more harm to your gums and eventually lead to an infection. This gum abscess is known as a periodontal abscess. Decay isn’t the only way that bacteria can reach vulnerable parts of your teeth. Injuries to your mouth can cause more impact force than your teeth are capable of withstanding. Without a mouth guard, you’ll likely crack or even break a tooth completely. These cracks instantly open a direct route to areas deep within the tooth. Like a cut or deep scrape on your body, bacteria can reach and infect this new open wound quickly and quietly. This is why it’s important to know how to handle a dental emergency! Unlike wounds to your skin, a cracked or broken tooth can’t heal on its own. You need to find an emergency dentist or schedule an appointment the very next morning to reduce your chances of complications. The first step with any tooth abscess is for a dentist to determine whether or not you actually have one. In some cases, they can examine your tooth and gums for symptoms and visually confirm an abscess. In other cases, they may need to use a dental x-ray, which can also help identify potential bone loss. When the infection from a tooth abscess hasn’t become too severe, a dentist may only need a few steps to remedy it. They’ll start by draining the infection and deep cleaning the area to remove every possible trace of the bacteria. Many tooth abscesses also require root canals to reach deep enough to clear the bacteria and infection from the pulp of your tooth. If the abscess is deep and bone loss has occurred, your dentist may recommend tooth extraction. This is necessary to completely clear the infection, as well as for them to take steps towards healing the bone or gum tissue damage. In some cases, yes. After treatment, your dentist may recommend antibiotics to help clear the remaining infection if they were unable to completely drain the area. Depending on your risk of reinfection, they may also give you antibiotics to prevent additional complications as it heals. If you’re prescribed antibiotics, it’s important that you follow the complete regimen until the antibiotics are gone. Don’t stop just because it seems like your condition is improving or even when you think the infection is completely cleared. As tooth abscess pain worsens and symptoms appear, it becomes imperative that you find dental care as soon as possible. However, depending on the time of day or where you’re located, it’s not always feasible to find a doctor or dentist until morning. Tooth pain increases your sensitivity to certain types of foods or drinks. If you avoid them, you can save yourself from needless stinging pains. The two main culprits are extreme temperatures and acidic foods. Coffee, hot tea and freezing drinks are likely to hurt if they contact the abscessed area. Citrus foods or drinks will do the same! The bacteria from an abscess will cause inflammation. One way to reduce it and help minimize tooth abscess pain is with a warm salt water rinse. Gently swish the salt water around for about 30 seconds. You can repeat this as many times as necessary – just don’t swallow the salt water! Pain relivers can also help you manage the pain from your tooth abscess before you can get to a dentist. The most common type of OTC pain reliever would be ibuprofen, which will also help reduce inflammation. Are you experiencing tooth abscess pain? The professionals at Walbridge Dental can help! From routine cleaning and exams to advanced restorative treatments, we offer complete family dental care to families in the Millbury community. Contact us online to set up an appointment now or call us at 419-836-1033. This entry was posted in Dental Tips, Preventative Dental Care, Tooth Loss and tagged dental care, Tooth Infection, Toothache. Bookmark the permalink. Follow any comments here with the RSS feed for this post. Both comments and trackbacks are currently closed.